I first noticed the tell-tale tents of eastern tent caterpillars (Malacosoma americanum) in the nature area near our house about a week ago. Sure enough, when I did my post-freeze assessment of the backyard, a tiny nest was clinging to one of the apple trees — although it looked like no one was home. 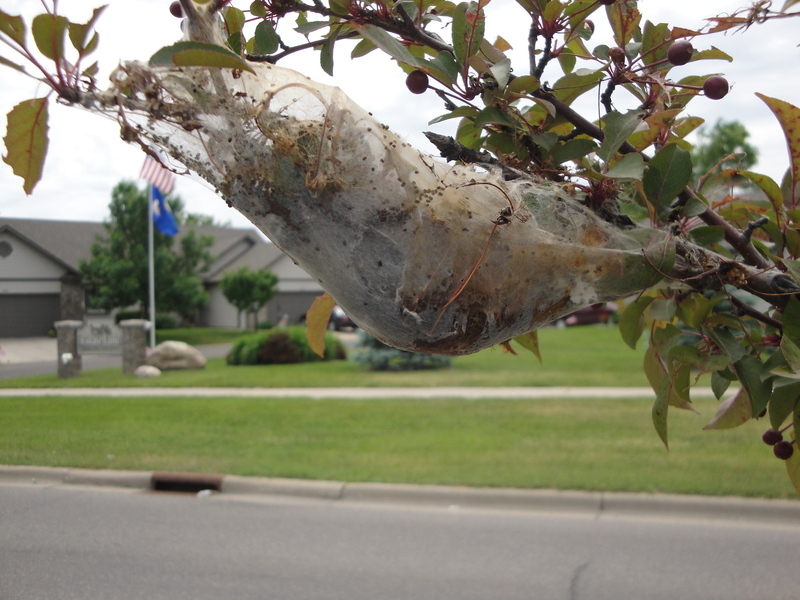 Eastern tent caterpillar nests can be large. Eastern tent caterpillars are a nuisance, although if left unchecked they can defoliate a tree. They are not to be confused with forest tent caterpillars (Malacosoma disstria), which are sometimes called armyworms. Unlike eastern tent caterpillars, forest tent caterpillars do not build a tentlike nest. They also have different food preferences. While eastern tent caterpillars feed on apple, cherry and plum trees, forest tent caterpillars like aspen, birch, basswood and oak. If you are not sure what kind of creepy crawly you have, check out these government fact sheets on forest tent caterpillars, eastern tent caterpillars and just for fun, gypsy moth caterpillars. I did not remove the nest from my tree yet, because it’s possible the freezes we have had the past few nights did the caterpillars in for me. If not, I’ll be snipping the tent soon. We had these on our apple tree last year and we saw a nest yesterday on the same tree. My husband burned it off with a torch. He used to work in a nursery (20 yrs ago as a high school student) and that’s what they did then. We have another apple tree of a different variety that hasn’t been affected.